In “Joy! Joy! 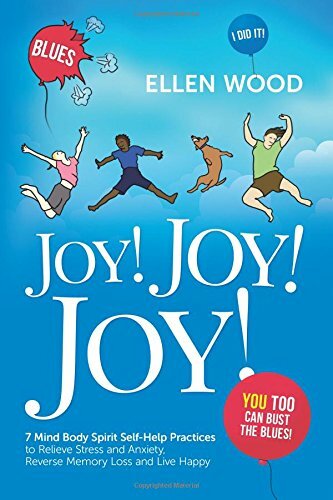 Joy!” Wood provides examples of self-help techniques that she has tested over time - lessons learned along her journey to regeneration that have reduced stress and negativity. In this publication, Wood expands her scope to encompass suicide prevention and target individuals dealing with anxiety and depression. In this easy-to-read text, the author puts her philosophy into practice by providing seven distinct steps for revitalization. These seven healthy practices are each given a chapter in the book and include: Observing Your Thoughts, Releasing Toxic Emotions, Say/Write an Affirmation, Power Posing, Dry Brushing Your Skin, Meditate and Do Something Good for Someone. Each chapter sets the stage for a daily regimen by providing small exercises to get you started and examples from the author’s own life to enhance meaning. At the end of each chapter, the reader is given a simple set of steps for daily practice that take minutes to complete. Wood’s guide inspires you to succeed by offering specific tips to accomplish down-to-earth goals. Her analogies get the point across and cement them inside your brain. She furnishes real life advice and asks you to challenge yourself gradually and with compassion, instilling the reader with a desire to proceed. In addition, the author provides her contact information so that you can reach out to her for extra checklists or supplemental instruction. The last two chapters are Wood’s strongest. She describes meditation as “physical fitness for the mind” and goes on to explain how the mind can be the most powerful indicator of general health and how it affects our bodies at a cellular level. She touches on the role that energy plays in stress and the importance of creativity and inspiration. Here again, Wood provides an excellent assortment of suggestions and examples for incorporating meditation and self-love into one’s daily life. Throughout her text she references so many worthwhile studies and other author’s works that I found myself wishing for a resource list at the back of the book. The one thing that would improve the book’s understanding is its structural layout. The way that the chapters and sections are designated is a little ambiguous. Wood uses an illustration to introduce each chapter. While this adds flavor and connects strongly to the topic, it does not clearly signify that a new chapter is beginning, which could throw off a reader. Also, the subtitled sections within the chapters are inconsistent. Some of the sections are labeled with textbook-like headings while others are merely descriptively tagged. Although there may be some structural issues with the book’s presentation, its content is chock full of gems that will have the reader taking notes for future reference. It is evident that Wood has made this topic her life work and is passionate about her process. There is no doubt that I will be applying many of her methods to my own personal and teaching practices. From her own experience with sugar intake and its role in mental and physical health to her tips on dry brushing, EFT tapping, skin stimulation and a myriad of other mental health exercises, this author presents the total package for health and well-being. Ellen Wood’s system of regeneration will appeal to those with a strong sense of organization. Her Daily Practice Checklists are well thought out and methodical. If followed routinely, they will surly keep you accountable and moving toward your goal to reduce stress and live happy. According to my life-long analysis of mind-body-soul modalities, Wood’s approach is spot-on. My personal research concurs that “Joy! Joy! Joy!” is a superb holistic guide to self-improvement that can assure transformation and long-term change for greater peace.